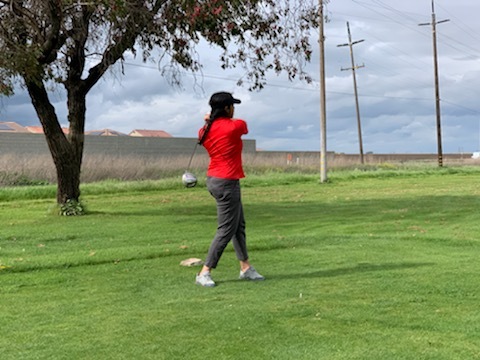 From injured players to wind and rain, the golf team’s second match of the season, March 8 at Cypress Lakes Golf Course, had plenty of twists and turns. Two of the team’s top six players (senior captain Harrison Moon; juniors Emma Boersma, Anu Krishnan, Yumi Moon and David Situ; and freshman Nihal Gulati) were unable to play. Situ previously injured his knee, and Yumi Moon had a conflicting event. Since the tournament required minimal attendance of five players, there were no team scores, and the match did not count in the league standings. Furthermore, according to Harrison Moon, the team’s small size affected its cohesiveness and motivation. Harrison Moon added that to overcome these challenges, the team needed to work on picking up its pace. However, it wasn’t just the team’s size that affected the pace. According to Harrison Moon, the weather was very humid, and Krishnan said it was extremely windy early in the match. During the last four holes, it even rained. The course proved to be another challenge. Harrison Moon said the last holes were difficult to navigate due to doglegs. “You either have to cut through (the dogleg) or go around it, but it’s hard to maneuver,” he said. Still, Harrison Moon said he was proud of the team’s performance considering the circumstances. “Completing the nine holes was impressive by itself,” he said. The team’s next match is on Thursday, April 11, at Rancho Solano Golf Course in Fairfield.